Next week, AHCA/NCAL members will travel to Washington, D.C. to hear the latest news from Capitol Hill, share ideas, network, and meet with their Members of Congress and their staff. It's the most powerful way to be heard and have an impact. This Congressional Briefing, members will be able to ask Members of Congress to protect Medicaid from cuts to ensure seniors and individuals with disabilities have access to quality long term care. Members will have the opportunity to share real life examples on how issues affect providers and their residents and patients. Attendees will hear from chief political correspondent, Bret Baier at the Fox News Channel as this year's keynote. Also joining the conference will be Ranking Minority Member on the House Ways & Means Committee, Congressman Richard Neal (D-MA) and Senator John Hoeven (R-ND). To help our members prepare, several key issue briefs and important documents are available online in advance. Also, search in your app store to download our free advocacy mobile app. Android or Apple users may search "AHCA Care" in Google Play or iTunes and download the latest tool for easy access to issue briefs, directories, economic information by state and more. Visit CB.ahcancal.org for updates and to see the complete agenda. Follow along on Twitter using #WeAreSolution for the latest updates on social media. Earlier this month, the Administration for Community Living (ACL) launched a webinar series reflecting the agency's commitment to and development of measures for home and community-based services (HCBS) quality. The series provides a platform for internal and external stakeholders to share developments and collaborate on HCBS quality efforts. A transcript (PDF), recording, and slides (PDF) from the first webinar in this series are now available. The webinar included and overview of ACL's work on HCBS quality measures, why this work is important, and an update on HCBS quality measures progress, including findings and impact. The next webinar in the HCBS quality webinar series will be on Wednesday, June 28. Additional details and registration instructions will be sent out by ACL by June 7. The U.S. Department of Health and Human Services (HHS), Administration for Community Living (ACL), and Office on Women’s Health (OWH) have launched their first website focused on helping communities to promote the oral health of older adults. Users will be able to find nearly 200 community-based oral health programs through the site’s searchable database, as well as an Oral Health Guide designed to help local organizations start or enhance their own programs. The need for maintaining good oral health and getting regular check-ups is widely recognized, but there are often large gaps in availability and accessibility of services for older adults, particularly for older women given their longevity and economic resources. Through this new resource, ACL and OWH aim to help close those gaps and assist communities, governments, and other organizations in improving access to high quality oral health care for older adults. The searchable database can help communities identify an ideal program for replication or enhancement based on diverse search criteria. A community considering the start of its own mobile dental unit, for example, could search for existing programs that fit this criterion and learn more about this type of program. The accompanying Oral Health Guide can further assist communities in launching or enhancing their own program. Key tips, case studies, external resources, and other sources of support are included in the Oral Health Guide. For communities that already have an oral health program in place for older adults, the Oral Health Guide can assist with expansion or enhancement. In May, the Department of Health and Human Services, Office of Inspector General (OIG) released its Medicaid Fraud Control Units (MFCU) 2016 Annual Report, which highlights statistical achievements from the investigations and prosecutions the 50 Medicaid Fraud Control Units (MFCUs) conducted from FY 2012-FY 2016. In 2016, MFCUs reported 1,564 convictions, over a third of which involved personal care services attendants. Fraud cases accounted for 74 percent of the 1,564 convictions. The number of convictions related to drug diversion cases increased from FY 2015. MFCUs also reported 998 civil settlements and judgments, with settlements with pharmaceutical manufacturers making up almost half of all the settlements. Lastly, MFCUS reported almost $1.9 billion in criminal and civil recovers. AHCA/NCAL members looking for quality on-line dementia care training for staff can take advantage of a special “Members Only” discount of 10% off any/all CARES® online dementia training program packages with discount AHCA10. These programs support the AHCA/NCAL goal of reducing the off-label use of antipsychotics and the CARES® training program is also recommended by CMS. CARES® is non-pharmaceutical based training that incorporates person-centered care strategies— including HCI’s trademarked CARES® Approach—throughout all of its CARES programs. In addition, individuals can become certified in Alzheimer’s Association® essentiALZ® or essentiALZ Plus after completing CARES programs and passing certification exams. CARES® is affordable with individual course prices ranging from $24.95 to $49.95. Unlimited single site licenses are also available. Check out CARES® online dementia training programs today and don’t forget to enter discount code AHCA10 to receive 10% savings on all orders. There could come a time when you or a loved one will require additional care. There are a lot of important choices to make. How do you even begin planning? Who can provide the right kind of care? How do you pay for care? It can be overwhelming to plan for the future. 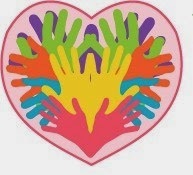 Wherever you may be in your planning, the Care Kit Builder, a free resource from CareConversations.org can help guide you. Just by answering a few questions, the Care Kit Builder will create a personalized, interactive toolkit to help you prepare for the future. The Care Kit Builder asks six easy questions to help determine the best resources for your care needs. It won’t require looking up any medical records or log in information. It will ask who you are planning for and what types of assistance you are requesting. It will then personalize your toolkit for care option you wish to learn about in that state. If you or a loved one could benefit from some expert planning assistance, access this free Care Kit Builder today. CareConversations.org provides expert knowledge, guidance, and insights into the care planning process. You can also find a care center near you and learn more about the different care options available. Time is Running Out to Nominate a 2017 Champion of Quality! The deadline to submit nominations for the 2017 Mary K. Ousley Champion of Quality Award is just over one week away! This award recognizes an individual who has made significant national contributions to advancing quality performance in the long term and/or post-acute care professions, in either skilled nursing or assisted living communities. Nominations can be submitted online directly here and are due by Friday, June 9 at 11:59 p.m. ET. Nominations must be submitted by AHCA members, but recipients of the award are not required to be AHCA members.The 2017 recipient will be announced on or before July 25 and the award will be presented at the 68th Annual AHCA/NCAL Convention & Expo on October 15-18 in Las Vegas! · Initiative in innovation for quality care. For more information, visit the Champion of Quality award page or email Erin Prendergast with questions. · Consistently had off-label antipsychotic usage rates that were three to four percentage points lower than the national average. AHCA/NCAL Gero Nurse Prep is affordable. RNs who are interested in boosting their credentials and expertise can become board certified for less than $1,100 ($690 AHCA/NCAL member price for Gero Nurse Prep and a separate $395 to take the ANCC exam). Watch this video to learn more about AHCA/NCAL Gero Nurse Prep or click on the course preview to get a quick view of this engaging on-line curriculum designed to help RNs pass the ANCC exam. Get an edge on your competition with a RN team specifically trained to deliver competent geriatric nursing care. Check out AHCA/NCAL Gero Nurse Prep today. The American Health Care Association (AHCA) was pleased to see the support for the establishment of Veterans Care Agreements in the President’s fiscal year (FY) 2018 budget. Specifically, the legislative proposal would authorize the Department of Veterans Affairs (VA) to purchase care in certain circumstances through agreements that are not subject to certain provisions of law governing Federal contracts. The proposal would also permit VA to enter into similar agreements with State Veterans Homes. An agreement under the proposed legislation could be awarded without regard to competitive procedures and would not subject a provider to certain laws that are not applicable to providers and suppliers of health care services through the Medicare program. AHCA has been advocating for policies which would grant the VA the legislative authority to enter into Provider Agreements for extended care services, including skilled nursing care centers. VA Provider Agreements would ensure that our centers are able to care for veterans in their communities and provide them access to quality health care. Our centers already meet very strict compliance guidelines under the Medicare and Medicaid programs. Adding additional regulations on top of this is simply inefficient, redundant and takes staff time away from these veterans at the bedside. 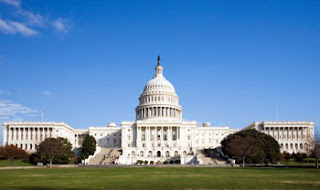 AHCA/NCAL attendees at this year’s Congressional Briefing are invited to attend NCAL’s Assisted Living Session to hear about the top priorities for Congress and prepare for their Hill visits. The session will be at the Hyatt Regency Washington on Capitol Hill, meeting room Columbia A, from 2:30-3:30 p.m.
Former Senator Blanche Lincoln (AR) and former Congressman Charles Boustany (LA), both legislative consultants, will provide a DC update, focusing on the outlook for the American Health Care Act and other bills that could affect assisted living providers. Rod Burkett, CEO of Gardant Management Solutions and Chair of the NCAL Finance & Policy Committee, will present along with Lilly Hummel, Senior Director of Policy for NCAL, on assisted living talking points for going on Hill visits. Attendees will benefit from this in-depth dive into issues affecting assisted living providers. 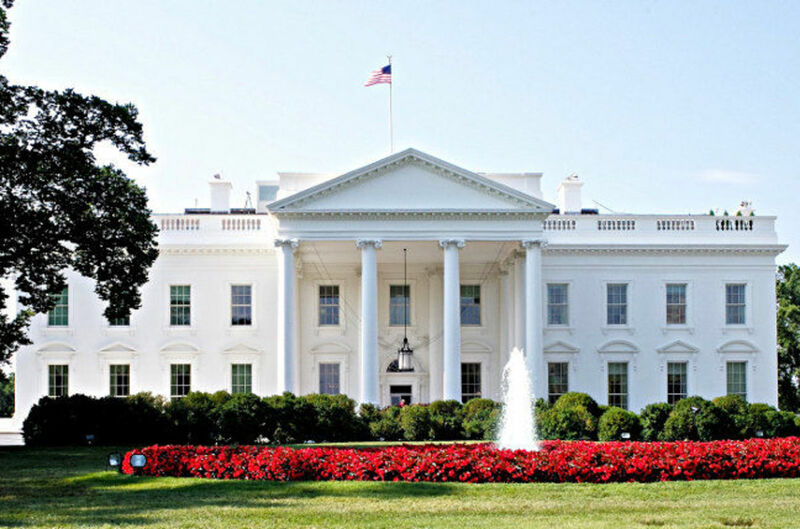 On May 22, the White House released detailed department budgets. This is part of President Trump's $4.1 trillion budget proposal for fiscal year (FY) 2018, A New Foundation For American Greatness. Overall, the plan projects to collect $3.65 trillion in revenue and balances the budget in 10 years. It includes $3.6 trillion in spending cuts over 10 years, with $1.7 trillion of that savings coming from mandatory spending. The plan includes more than $800 billion in savings from health care, mostly from repealing the Affordable Care Act (ACA), saving $250 billion, and reforming Medicaid and the Children's Health Insurance Program, saving $616 billion. It does not include cuts to Social Security or Medicare. For the U.S. Department of Health and Human Services (HHS), the FY 2018 budget proposal is asking for $69 billion in discretionary budget authority for HHS, a decrease from President Obama's $82.8 billion request for FY 2017. The proposal includes $1.046 trillion in mandatory funding. The HHS proposal would save $665 billion over 10 years. The administration says the HHS budget focuses on direct services and proven investments while streamlining or eliminating programs that are believed to be duplicative or have limited impact. Key elements of the HHS budget include Medicaid as a saver, Independent Payment Advisory Board, program integrity, other programmatic changes, medical liability, and the ACA. AHCA/NCAL has drafted a summary with highlights from the U.S. Department of Health and Human Services (HHS) budget. The President's budget is a blueprint. Congress may or may not follow this as it prepares the formal Budget Resolution, which frames federal government operations. AHCA will be heavily engaged as these proposals are considered by the Congress and will continue to provide the latest information on the President's budget proposal and other happenings on Capitol Hill. The California Association of Health Facilities’ (CAHF) director of clinical affairs, Jocelyn Montgomery, and other emergency preparedness experts were interviewed by Steven Ross Johnson of Modern Healthcare for a May 17, 2017, article entitled, “Nursing homes and hospice providers face looming emergency preparedness deadline” on the Emergency Preparedness CMS final rule. The rule was released on Friday, September 16, 2016, and can be found here. CAHF and AHCA have put together a Skilled Nursing Facility (SNF) and Intermediate Care Facility for Individuals with Intellectual and Developmental Disabilities (ICF/IID) Emergency Preparedness CMS Final Rule summaries that can be found here. Providers will need to comply by November 2017. Members impacted by the rule include SNFs, Nursing Facilities and ICF/IIDs. This final rule is not applicable to Assisted Living Providers. 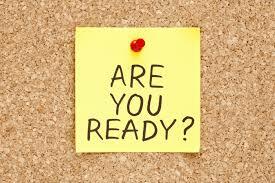 AHCA has an Emergency Preparedness Final Rule Webinar Series that can be found here. The Secretary of the U.S. Department of Health and Human Services (HHS) established the Advisory Council on Alzheimer’s Researcher, Care and Services to provide advice and consultation to the Secretary on how to prevent or reduce the burden of Alzheimer's disease and related dementias on people with the disease and their caregivers. The Secretary signed the charter establishing the Advisory Council on May 23, 2011. HHS is now soliciting nominations for seven (7) new non-Federal members of the Advisory Council to replace the seven members whose terms will end September 30, 2017. Nominations must be submitted before COB on June 16, 2017. For more information, please review the entire 2017 request for nominations. Calling All Graduates – The Long Term Care Career Center is a Great Place for Jobs! Graduation ceremonies are happening all across the country this month. The AHCA/NCAL Long Term Care Career Center, is a great resource for nursing students and high school and college seniors who are interested in careers in long term care or health care. Our Center contains a Career Learning Center that includes professional resources for creating powerful resumes and acing job interviews. 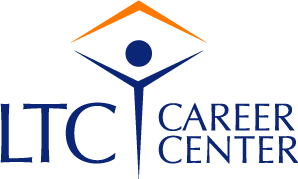 The LTC Career Center is always free for job seekers. And, job seekers are using the site! Job postings on the AHCA/NCAL Long Term Care Career Center, average more than 1,700 views a month. That big number means the LTC Career Center has the jobs people want and qualified candidates searching for positions. Creating an account and posting a resume is quick, free and easy! Give the graduates you know a gift that will be remembered – their first job leads. Tell them about the LTC Career Center and the free Career Learning Center job seeker resources today and help them launch their health care careers. Webinar: Bundled Payment Where Do We Go from Here? Join AHCA's James Michel, Senior Director, Medicare Reimbursement & Policy, on a webinar that will provide an update on the association’s current thinking and strategy regarding CMS’ various bundled payment programs. Hear about AHCA members’ early experience with the various bundled payment programs and how those experiences are informing ongoing work to advocate for bundled payment models that are workable for skilled nursing providers. Additionally, attendees will learn about the current policy landscape and what we know so far about how the new administration views bundled payment programs, what action policymakers could take in the short- and long-term, and the likely fate of ongoing demonstrations. Finally, AHCA’s current research effort to advance a post-acute care bundled payment proposal to CMS and an overview of the tools and resources available to AHCA members will be discussed. Bundled Payment: Where Do We Go from Here? The webinar is free to members. There are no CEUs offered. The webinar will be recorded and archived for those members that cannot join live on July 25. Registration is now open. In order to access the webinar you will need an ahcancalED account. If you have not already done so, please take a few moments to create one prior to the date of the webinar. Registration is easy. After you click the link in the webinar title, you will see a green box in the upper right corner of your screen. If you have an account (it is the same log in information that you would use to access the AHCA website) – click log in now. If you need assistance with your password – please email educate@ahca.org. If you need to create an account, click Register and follow the few simple prompts. On May 22, 2017, the Administration for Community Living (ACL) released an email with a reminder about taking precautions with the extreme summer heat that will soon be upon us. 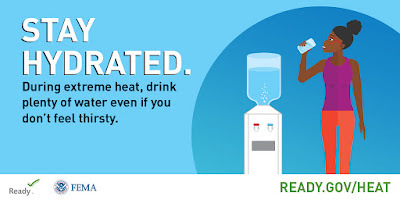 A few helpful resources ACL pointed to include ready.gov/heat and cdc.gov. In addition, they noted a link to information on preparing a basic disaster supplies kit. Finally, the email included the mention of the The HHS emPOWER Map 2.0 that features the monthly total of Medicare beneficiaries with electricity-dependent equipment claims at the U.S. state, territory, county, and zip code level to identify the areas and populations that may be impacted and at risk for prolonged power outages. Mark Parkinson, President & CEO of AHCA/NCAL, Mike Cheek, Senior Vice President for Reimbursement for AHCA, and Mary Ousley, Co-Chair of the AHCA Quality Cabinet, provided an overview of the proposed Medicare payment reform the Centers for Medicare and Medicaid Services (CMS) included in their April 27 pre-rule. The pre-rule solicited comments on potential revisions to the SNF payment system. The recorded May 17 webinar on CMS’s proposed Medicare payment reform is now available. Members may access the webinar here: Overview of CMS Proposed Medicare Payment Reform with your ahcancalED log in information. The Occupational Safety and Health Administration (OSHA) is extending a deadline for employers to electronically submit workplace injury and illness data under a final rule that was published in May 2016. The former compliance deadline related to Form 300A had been July 1, 2017. OSHA has not set a new deadline. 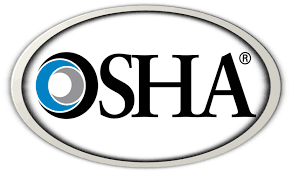 Employers that have 250 or more employees are required to electronically submit to OSHA the injury and illness information that they already collect on OSHA Forms 300, 300A and 301 every year. Some businesses, including assisted living communities and nursing centers, with 20 to 249 employees are required to electronically submit information from Form 300A only. Part Six of the Quality Initiative Series will include a live webinar called "Section GG of the MDS-Successful Submission Tips for the SNF QRP Functional Process Measures." Hosted with presenter Ellen R. Strunk, PT, MS, GCS, CEEAA, CHC the President and Principal Consultant, Rehab Resources and Consulting, Inc. The Improving Post-Acute-Care Transformation Act (IMPACT) of 2014 requires the standardization of patient assessment data reported in each post-acute care setting (Inpatient Rehab Facilities, Long Term Care Hospitals, Skilled Nursing Facilities and Home Health Agencies). Beginning October 1, 2016, skilled nursing facilities began collecting mandatory data items related to functional status at admission and discharge from the facility. The intent of the collection of data is to facilitate consistent communication and care processes between settings as well as provide the basis for comparing patient types, outcomes of care and costs associated with that care between settings and longitudinally. This webinar will provide information on how to insure your facility meets the requirements for the functional measure currently included in the skilled nursing facility Quality Reporting Program. 1. Describe the functional measure implemented in the skilled nursing facility effective October 1, 2016. 2. Understand the definitions of the mandatory self-care and mobility items for skilled nursing facility. 3. Implement a process to validate whether your facility has successfully submitted information to meet the reporting threshold. Rehab Resources and Consulting, Inc.
Increasing budget predictability and managing costs. The Urban Institute has released a new report assessing the adequacy of income allowances for Medicaid home and community-based services (HCBS). The findings suggest that some states do not allow Medicaid HCBS enrollees to retain enough income to cover community living expenses. Raising Medicaid HCBS income allowances could enable more older adults with disabilities to remain in the community and receive the care they need. The study measured household expenditures made by older adults living in the community and compared them to the Medicaid HCBS income allowances provided by the state in which they reside, to see how much they would have to reduce their spending if they enrolled in Medicaid HCBS and did not allow their expenses to exceed those income allowances. Hospital readmissions not only have the potential for negative physical, emotional, and psychological impacts on individuals in skilled nursing care, but also cost the Medicare program billions of dollars. Although significant progress has been made in the safe reduction of 30-day hospital readmissions, more must be done. Preventing these events whenever possible is beneficial to patients and has been identified as an opportunity to reduce overall health care system costs by improving quality. The issue has become a top priority for the Centers for Medicare & Medicaid Services (CMS) and managed care programs. Starting October 1, 2018, all SNF Medicare Part A rates will be cut by 2 percent to fund an incentive payment pool. At that time, CMS will adjust payments and return some amount to providers based on how well they do in managing their 30-day hospital readmissions by meeting or exceeding performance standards. This CMS effort, the Skilled Nursing Facility (SNF) Value Based Purchasing (VBP) Program, links financial outcomes to quality performance. Improvement in readmission rates between CY 2015 and 2017. Tracking quality metrics to understand their performance. Comparing rates to state and national benchmarks to have a better understanding of performance relative to others. 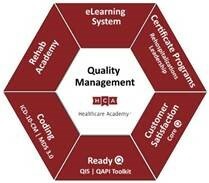 Improving performance through implementation of quality improvement programs (e.g., INTERACT). Reviewing confidential feedback quarterly reports using the CMS QIES System. Visit the ahcancal.org/SNFVBP website here to learn more about the program and to access tools and resources. On May 3, 2017, Senators Susan Collins (R-ME) and Tammy Baldwin (D-WI) re-introduced the Recognize, Assist, Include, Support, and Engage (RAISE) Family Caregivers Act (S. 1028) in the U.S. Senate. Senators Lisa Murkowski (R-AK) and Michael Bennet (D-CO) are original co-sponsors. This legislation, which AHCA/NCAL supports, would implement the federal Commission on Long-Term Care’s bipartisan recommendation that Congress require the development of a national strategy to support family caregivers. The bill would create an advisory body to bring together representatives from the private and public sectors to advise and make recommendations. The strategy would identify specific actions that communities, providers, employers, government, and others can take to recognize and support family caregivers and be updated. Last Congress, the full U.S. Senate considered and passed this legislation. It did not come up for full U.S. House of Representatives’ consideration though before the end of last Congress. On May 11, 2017, the U.S. Senate Committee on Health, Education, Labor & Pensions (HELP) considered and approved this legislation by unanimous voice vote. It now awaits full Senate consideration. According to AARP, about 40 million family caregivers provide about $470 billion annually in unpaid care to their loved ones. According to the Caregiving in the U.S. 2015 study from the National Alliance for Caregiving and AARP, about 3.7 million family caregivers provide care to a child under age 18 because of a medical, behavioral, or other condition or disability, and 6.5 million family caregivers assist both adults and children. A new computer threat called WannaCrypt has been in the headlines lately. WannaCrypt is malicious software, or "ransomware", that locks users out of the files stores on infected computers and forces them to pay to regain access. This threat is taking advantage of security vulnerabilities of older versions of Microsoft Windows. Microsoft released an update to patch this problem in March 2017. Users who installed the patches were not affected. Contact your local FBI Field Office Cyber Task Force immediately to report the ransomware event and request assistance. Report cyber incidents to the FBI's Internet Crime Complaint Center. Share health care-specific information with HHS' Healthcare Cybersecurity and Communications Integration Center at HCCIC_RM@hhs.gov. For additional cyber threat information, check out the US Computer Emergency Readiness Team at the Department of Homeland Security's website https://www.us-cert.gov/ncas. 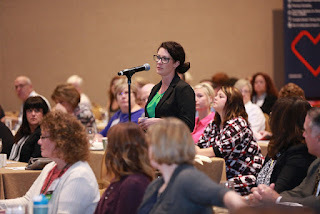 Every year, NCAL strives to meet our mission of leading the assisted living profession through public policy advocacy, knowledge, education and professional development. In 2016, NCAL fulfilled its mission through persistent progress—the focus of the association’s digital annual report. This year’s annual report also features a video message from Executive Director Scott Tittle, discussing not just highlights from 2016, but offering perspective on what may come in 2017. AHCA also released its digital annual report. As a united association, we are improving lives by delivering solutions for quality care. 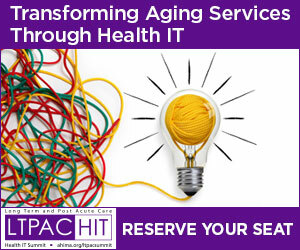 Register Now for the LTPAC Health IT Summit June 25-26 in Baltimore! As a proud, founding member of the Long Term and Post-Acute Care (LTPAC) Health IT Collaborative, AHCA/NCAL works with The American Health Information Management Association (AHIMA) and our other partner organizations to plan and execute the annual LTPAC Health IT Summit! This year’s summit will be held on June 26 and 27 in Baltimore, MD. 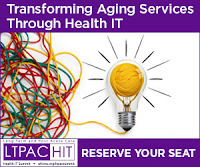 The 13th Annual LTPAC Health IT Summit is the only conference of its kind that convenes clinical, operational, and IT experts working in long term and post-acute care settings to address the most urgent and pertinent clinical technology challenges facing our sector today. The summit showcases health care transformations and clinical technology innovations that support clinical processes, such as transitions of care, care coordination, care planning, and the role technology plays in supporting new payment and value-based care delivery models. Learn more and register today. The Department of Health and Human Services, Office of Inspector General (OIG) has released its updated List of Excluded Individuals and Entities (LEIE) database file, which reflects all OIG exclusions and reinstatement actions up to, and including, those taken in April 2017. This new file is meant to replace the updated LEIE database file available for download last month. Individuals and entities that have been reinstated to the federal health care programs are not included in this file. 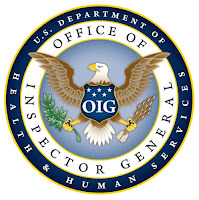 The updated files are posted on OIG’s website at http://www.oig.hhs.gov/exclusions/exclusions_list.asp, and health care providers have an “affirmative duty” to check to ensure that excluded individuals are not working in their facilities or face significant fines. Instructional videos explaining how to use the online database and the downloadable files are available at http://oig.hhs.gov/exclusions/download.asp. Given the penalties and recent government warnings, long term care providers should check the LEIE on a regular basis. There are 20,388 open jobs this month in the nursing care facility (including SNFs), assisted living, and continuing care retirement community (CCRC) sectors this month according to the latest CEB TalentNeuron statistics. The number of open jobs posted nationwide by direct employers held relatively steady over the last two months. The CEB TalentNeuron statistics also show an estimated 2,101,000 potential candidates in the nation’s workforce whose skills likely match the qualifications being sought by long term care employers – a decrease of 85,000 compared to April. Figures show that 2,052 direct employers are competing for candidates in May – a slight decrease over April figures. The average number of days a job is posted this month is 34. Finding qualified employees is one of the greatest challenges facing long term care providers. The AHCA/NCAL Long Term Care Career Center is designed to help members be competitive in attracting qualified candidates to fill their health care job vacancies. This is the perfect time to give the Long Term Care Career Center a try because new users receive 25% off their first posting. Simply enter promo code New25off to receive this special discounted price. Of course, the LTC Career Center is always free for job seekers. And, job seekers are using the site with more than 86,000 searchable resumes on the National Healthcare Career Network this month. Job postings on the AHCA/NCAL Long Term Care Career Center network are averaging more than 1,700 views in April. Employers who utilize the site also receive outstanding exposure through rotating job listings on AHCA’s home page – the web site where long term care professionals go for news and information. In addition, employers who post vacancies through the center receive bonus rotating listings on the Long Term Care Career Center home page. Be seen nationwide. Check out the LTC Career Center today and remember to enter promo code New25off to save 25% on your first job posting. The SNF Quality Reporting Program (QRP) submission deadline changed from May 15, 2017 to June 1, 2017. Late last week, AHCA heard from many members who received inaccurate notifications from CMS indicating they had failed to submit data for the QRP. It was a problem on CMS’s end and after several emails with CMS and a quick phone call, CMS assured us they would extend the submission deadline. Over the weekend, CMS included a notice in their daily email and also posted an update to the CMS SNF QRP website. The email included the following information: Due to extenuating circumstances, the reporting deadline for the Skilled Nursing Facility (SNF) Quality Reporting Program (QRP) Fiscal Year 2018 payment determination has been extended from May 15, 2017 to June 1, 2017. The MDS assessment data for October-December (Q4) of calendar year 2016 are due with this submission deadline. For a list of measures required for this deadline visit the SNF Quality Reporting Program Data Submission Deadlines webpage. At this year’s AHCA/NCAL Convention & Expo you can score up to 16 NAB CEUs. New this year, nurses can earn ANCC contact hours! * If you want a bigger win, you can increase your CEU/CE count by participating in a variety of separate ticked education sessions, occurring Sunday, October 15. Sessions cover assisted living, rehabilitation therapy, and dementia care. Again, these sessions are not included with any registration package and must be purchased as a separate ticketed education event. If you want to go for the jackpot, be sure to register for the Premium Full Package. You’ll get access to all recorded sessions along with synced handouts (if provided by speaker). Convention sessions are available post-convention in a webinar format and you can earn even more CEUs/CE. If you haven’t registered yet, don’t wait any longer. Early bird registration discounts available through July 21. *This activity is jointly provided by the UNMC CON CNE (provider) and AHCA/NCAL. The University of Nebraska Medical Center College of Nursing Continuing Nursing Education is accredited with distinction as a provider of continuing nursing education by the American Nurses Credentialing Center’s (ANCC) Commission on Accreditation. Total ANCC contact hours for this event to be determined. Through the Volunteer of the Year (VOY), ID/DD Hero of the Year, Not for Profit (NFP) Program of the Year and NFP Trustee awards programs, the American Health Care Association and the National Center for Assisted Living (AHCA/NCAL) honor those individuals who are dedicated to improving the quality of lives of residents and their surrounding communities. The deadline for AHCA receipt of all nominations is Friday, June 9, 2017. The nomination applications can be found online. Just as a reminder, whereas the Volunteers of the Year nomination form MUST be submitted by a state affiliate organization, the ID/DD Hero of the Year, the NFP Program of the Year and NFP Trustee nomination forms can be member-submitted directly to AHCA electronically. All nominations must be typed and submitted electronically this year. Faxed or handwritten nominations are not accepted. Honorees in each category will be recognized at AHCA/NCAL’s 68th Annual Convention and Expo, October 16-18, 2017, in Las Vegas, Nevada. 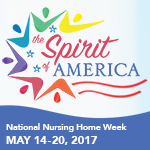 Today, thousands of America’s skilled nursing care centers and local communities are celebrating National Nursing Home Week® (NNHW). This year's annual observance began on Sunday, May 14, and will continue through Saturday, May 20. Established by the American Health Care Association (AHCA) in 1967, NNHW recognizes the role of skilled nursing care centers in caring for America’s seniors and individuals with disabilities. This year’s theme, “The Spirit of America,” honors the bond shared among staff and residents through special events and activities that capture the American spirit. Skilled nursing center providers and members of the public can share their celebrations throughout the week on social media with the hashtag #NNHW. Check out the NNHW Facebook page to see how centers across the country are participating in the celebration and visit our website for last minute ideas and planning guidance. Members of the American Health Care Association and National Center for Assisted Living (AHCA/NCAL) are discovering the great value offered by ahcancalED. The online education portal hosts a multitude of resources – courses, training, and other tools created by experts from around the country – tailored specifically to support the long term care community in its quality journey. The Association is continually working to ensure members have access to the most up-to-date and relevant resources. In fact, three new action briefs were added last week to the RequireED section. Each action brief – Resident Assessment, Nursing Services, and Physical Environment – provides highlights of the specific requirement, implementation strategies and tips, and information about additional resources. Below are a few highlights from each action brief. The Resident Assessment requirement expands the condition to include resident strengths, goals, life history, and preferences in the comprehensive assessment. It also specifies that the assessment process must include direct observation and communication with the resident, as well as communication with licensed and non-licensed direct care staff members on all shifts. You can view the entire Resident Assessment action brief here. The Nursing Services requirement adds competencies and skill sets for determining the sufficiency of your nursing staff. Furthermore, it expands nursing and related services to assure resident safety. You can view the entire Nursing Services action brief here. The Physical Environment requirement highlights specific actions centers must take in order to ensure a safe physical environment for patients, such as provide sufficient space and equipment in order to deliver needed services to residents as required by the Requirements of Participation and the resident’s assessment and care plan. You can view the entire Physical Environment action brief here. These are only a few of the many resources available on ahcancalED, so visit today and explore them for yourself! Please note you will be required to log in and register to access these materials, but they are free and available for members to download at any time. For help with logging in, please review these frequently asked questions. Please email educate@ahca.org with any questions. AHCA/NCAL is encouraging all its members and advocates to contact their Senators and urge them to protect Medicaid funding as health reform legislation is considered in the upper chamber. Advocates nationwide were called to action with the message to preserve Medicaid funding long term care services for older Americans and individuals with disabilities. The campaign is ongoing and those interested can contact their Senators directly through the AHCA/NCAL web service. Senate Republicans are currently working on a plan to repeal and replace the 2010 health care law. The House voted 217-213 earlier this month on their own version of repeal and replace, though the Senate version of the bill is expected to differ. Central to the reform effort is a working group of 13 Senators, consisting of leadership, key committee heads, more conservative members of the caucus, and Senators from states that expanded Medicaid under the 2010 health care law. The bill is moving forward on reconciliation instructions, meaning any agreement can move forward with a simple 50-vote majority (Vice President Pence would break a tie). Last week, the American Health Care Association (AHCA) issued a statement in response to Senator John Hoeven’s (R-ND) questioning at a May 11, 2017, Senate Appropriations Subcommittee Military Construction and Veterans Affairs hearing on reducing burden and increasing veterans’ access to health care. 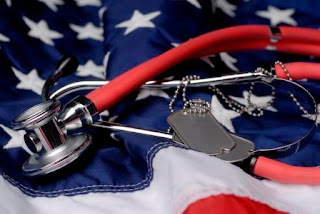 The hearing, which focused on the Veterans Access, Choice and Accountability Act of 2014 (the Choice Act), followed a recent Department of Veteran’s Affairs decision to remove a proposed rule that would have permitted “extended care” agreements between private long-term care providers, including skilled nursing care centers, and the VA. 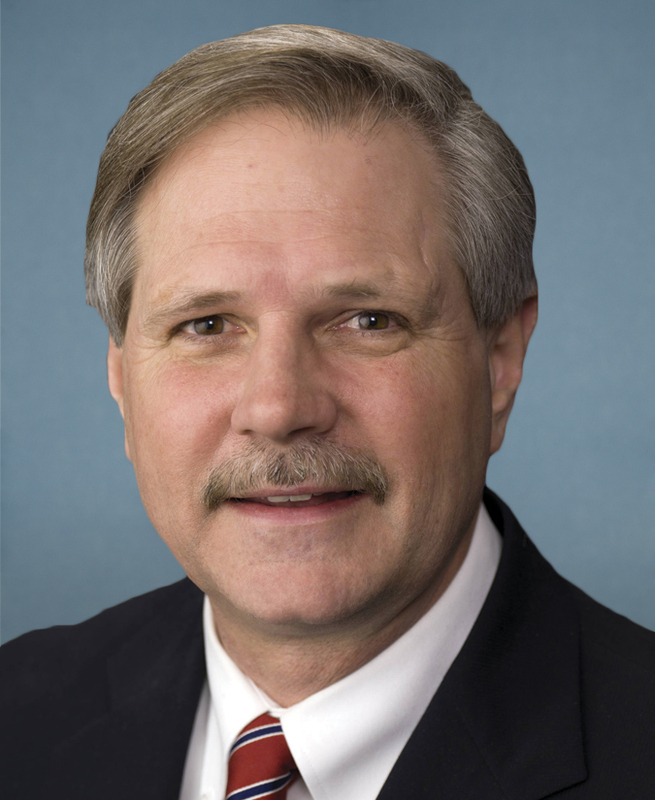 Senator Hoeven is actively working through legislation that he plans to introduce to ensure that skilled nursing care centers and other long-term care providers are eligible to provide care to veterans. The McKnight’s article on the hearing and the Senator’s work can be found here, and a press statement from Senator Hoeven’s office on the hearing is here. This unique learning opportunity at the 68th Annual AHCA/NCAL Convention and Expo in Las Vegas is back again this year by popular demand. Attendees will complete the CARES® Dementia Basics curriculum and learn about the training tools, techniques, and activities to implement the CARES® Approach within your organization utilizing the CARES® Classroom Guide™ for Administrators and Educators. Now through Friday, May 12 is National Nurses Week. With acuity on the rise in assisted living residents, nurses are playing an increasingly important role to ensure residents enjoy a high quality of life. While we can’t offer free stuff, we do want to thank all those nurses in assisted living for all that you do. Use this week to recognize the assisted living nurses in your world—on social media, with a card, a party, etc. Check out resources and ideas from the American Nurses Association. Or you can nominate them to be NCAL’s Nurse of the Year through our NCAL Awards Program. Just get a copy of their resume and craft an essay (no more than 500 words) on why you think they are Nurse of the Year. Visit www.ncal.org/awards to submit your nomination by June 9. The recipient receives a free trip and registration to AHCA/NCAL’s Annual Convention & Expo, this year in Las Vegas, October 15-18. They’ll be recognized by thousands of their peers at NCAL Day and at a general session during the convention. 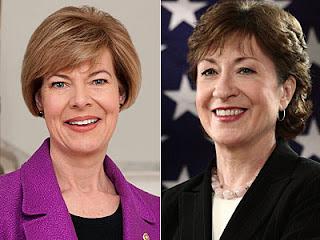 Last week, Senators Susan Collins (R-ME) and Tammy Baldwin (D-WI) re-introduced the Recognize, Assist, Include, Support, and Engage (RAISE) Family Caregivers Act (S. 1028) in the U.S. Senate. Senators Lisa Murkowski (R-AK) and Michael Bennet (D-CO) are original co-sponsors. This legislation, which AHCA/NCAL supports, would implement the federal Commission on Long-Term Care’s bipartisan recommendation that Congress require the development of a national strategy to support family caregivers. The bill would create an advisory body to bring together representatives from the private and public sectors to advise and make recommendations. The strategy would identify specific actions that communities, providers, employers, government, and others can take to recognize and support family caregivers and be updated. Last Congress, the full U.S. Senate considered and passed this legislation. It did not come up for full U.S. House of Representatives’ consideration though before the end of last Congress. The bill is anticipated to be considered by the Senate HELP Committee (Health, Education, Labor and Pensions) in the near future. Long term care staff can now get recognized for successfully completing the entire HealthCare Interactive CARES® online dementia care training curriculum (6 courses/32 modules) by earning the CARES® Dementia Specialist™ credential. By completing all training programs, submitting your documentation, passing the required 100-point online exam, and being approved, you will be able to use the C.D.S. credential after your name, on your resume, or on a business card. You will also be placed on a national registry of people who earn and hold a current C.D.S. credential. The CARES curriculum consists of 32 hours of online video-based person-centered dementia care education. Once activated, you will have 10-day access to each of the 5 professional caregiver courses and 30-day access to the CARES Dementia Care for Families program. AHCA/NCAL members receive a 10% discount on the $199.95 C.D.S. package by using discount code AHCA10 at checkout! That’s 32 hours of high quality online dementia care training for only $179.95. Take advantage of this outstanding bargain today and remember to use discount code AHCA10 when you checkout. Friday is the extended deadline to register for Congressional Briefing. After that, you must register on site beginning at 10 AM on June 5 at the Hyatt Regency in the Hall of Battles. Register today, and join your colleagues in Washington, D.C. June 5 and 6 to hear the latest news from Capitol Hill, share ideas, network, and get fired up. Then spend several hours meeting with your Members of Congress in-person. It's the most powerful way to be heard and have an impact. Visit CB.ahcancal.org to get all the details and see the complete agenda. The conference registration fee is complimentary to AHCA/NCAL Members and AHCA/NCAL Associate Business Members, and their spouses, and is accepted on a first-come basis. On May 9, the Centers for Medicare and Medicaid Services (CMS) released an Informational Bulletin extending the timeline for compliance with the Medicaid home and community-based settings rule. CMS indicates that states should continue progress with their statewide transition plan to be approved by March 17, 2019, but the agency is extending the transition period for states to demonstrate compliance with the settings criteria by 3 years to March 17, 2022. For assisted living communities and other providers of home and community-based services, this extension provides relief as they work with states to ensure they meet the criteria for a home and community-based setting. More guidance about the rule can be found here. The House of Representatives passed the American Health Care Act last Tuesday, moving forward Republican efforts to repeal and replace major parts of the Affordable Care Act. The bill now awaits Senate action. The bill passed 217-213 after modifications and amendments were made to gain the support of some lingering Republican holdouts. The Senate has begun their own work on health care reform efforts, assembling a group of 13 Senators to spearhead the negotiations. Members of the group contain Senate leadership, key committee heads, as well as Senators from states that expanded Medicaid under the Affordable Care Act. The bill may change significantly in the Senate before it returns to the House. There are specific parliamentary hurdles because the bill is passed on a budget reconciliation measure, which protects it from the Senate filibuster, but also means the content of the legislation must fall within a narrow set of guidelines. No Senate votes are currently scheduled on any health care reform legislation. The National Emerging Leadership Summit deadline has been extended till May 19th! Come engage with fellow emerging leaders in an unrivaled opportunity to strategize, advocate, connect, and innovate the future of the health and aging services profession. The National Emerging Leadership Summit in Washington, D.C. aims to increase, improve, and support the health and aging services profession to attract talent and future leaders by giving a voice to the next generation of leaders. There are 30 spaces available for the 2017 Summit. More information, and an application, is available at: http://www.nelssummit.org. Join this National Council on Aging webinar for an update on behavioral health topics relevant to older adults. One in four older Americans experience a behavioral health issue that is not a normal part of aging, yet they are less likely to receive treatment than younger individuals. The latest national data from the Substance Abuse and Mental Health Services Administration (SAMHSA) on depression, suicide, and substance abuse or misuse in older adults. A description of the Mental Health Association of New York City’s (MHA-NYC) initiatives to improve access to behavioral health services for older adults. Learn more about NCOA, SAMHSA. Congressional leaders reached a deal on a $1 trillion spending bill that will fund the government through September. The deal, struck Sunday night, is over 1,600 pages long and must be passed before Friday in order to avert a government shutdown. Congress passed a one-week, “continuing resolution” last week to keep the government funding as negotiations proceeded. The bill will likely pass easily because it contains key defense and domestic provisions lauded by leaders in both parties. Senate Minority Leader Chuck Schumer (D-N.Y.) said it is “a good agreement for the American people,” and “excludes poison-pill riders,” that might have derailed efforts at compromise. The legislation delivers wins to both parties. Among other items, the agreement contains $2 billion in new funding for the National Institutes of Health, $1.5 billion to repair existing border infrastructure, $15 billion to fight terrorism, and permanently extends health insurance benefits to coal miners.